PHILIPPIANS 3:14 KJV "I press toward the mark for the prize of the high calling of God in Christ Jesus." 11If by any means I might attain unto the resurrection of the dead. 12Not as though I had already attained, either were already perfect: but I follow after, if that I may apprehend that for which also I am apprehended of Christ Jesus. 13Brethren, I count not myself to have apprehended: but this one thing I do, forgetting those things which are behind, and reaching forth unto those things which are before, 14I press toward the mark for the prize of the high calling of God in Christ Jesus. 15Let us therefore, as many as be perfect, be thus minded: and if in any thing ye be otherwise minded, God shall reveal even this unto you. 16Nevertheless, whereto we have already attained, let us walk by the same rule, let us mind the same thing. 17Brethren, be followers together of me, and mark them which walk so as ye have us for an ensample. I presse toward the marke, for the price of the high calling of God in Christ Iesus. with my eyes fixed on the goal I push on to secure the prize of God's heavenward call in Christ Jesus. 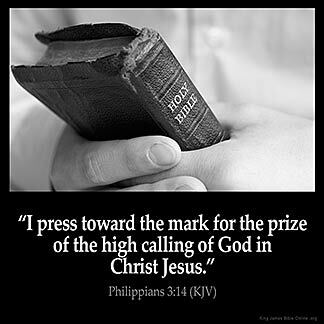 I press on toward the goal for the prize of the high calling of God in Christ Jesus. and pursue to the ordeyned mede of the hiy clepyng of God in Crist Jhesu. to the mark I pursue for the prize of the high calling of God in Christ Jesus. 3:14 Forgetting the things that are behind - Even that part of the race which is already run. And reaching forth unto - Literally, stretched out over the things that are before - Pursuing with the whole bent and vigour of my soul, perfect holiness and eternal glory. In Christ Jesus - The author and finisher of every good thing. Php 3:14 I press on toward the mark. His eye is upon the goal and he presses through every difficulty to reach it. For the prize of the high calling of God in Christ Jesus. This is the prize offered to those in the high calling of the saints in Christ. A crown was bestowed in an earthly race when the goal was reached. This prize is "the resurrection from the dead" (Php 3:11) and an eternal crown.